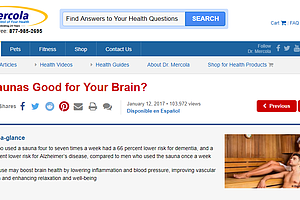 This article (click the title link) by Mercola confirms and summarises what we've been writing about for some time when it comes to saunas and brain health. Think you can't afford one? Think again. Our portable near infrared sauna has been designed from the ground up to be used in existing small spaces in your home such as a shower, bathtub or small closet. I see that some of your competitors give glasses with their units, saying that the NIR is not good for the eyes, on a video I took notice you say that isn't true. Is there any studies I can reference to prove that the NIR will not hurt my eyes if not protected? Also, ayurveda says that the head on our body should stay cool, yet that doesn't seem to be embraced with these NIR devices, can you comment on that? The research is definitive. NIR does not hurt the eyes, it heals them. Bright light can, and excessive heat can but NIR does not. I don't recommend looking at the bulbs but if concerned sunglasses are fine and the amount of heat present is short term and not enough to cause damage. Here is a link for eye research. Scroll down to #6. Just about that is an incredible spreadsheet you can also search.